Performances run through July 5th and tickets and additional cast information is available online. The Lakes Area Music Festival in Minnesota is featuring a barihunk trio in this summer's performances of Puccini's La bohème. The Festival features many of the most promising young musicians from America’s top conservatories who perform alongside members of the Minnesota Orchestra and St. Paul Chamber Orchestra in projects ranging from chamber music to orchestral repertoire and fully produced operas. 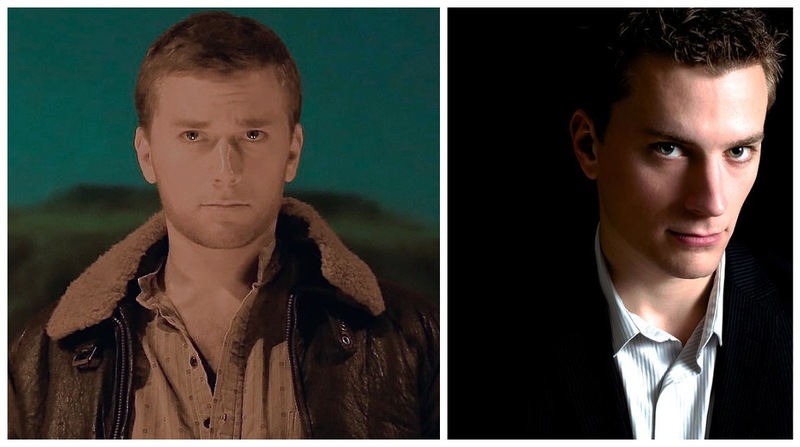 La bohème will feature Andrew Lovato as Schaunard, John Taylor Ward as Marcello and Nicholas Nelson as Colline. Lovato and Nelson have been featured numerous times on the site, including a recent post about Lovato making his Cincinnati Opera debut in Ricky Ian Gordon’s Morning Star as Harry Engel. Lovato is no stranger to Minnesota audiences, having been a member of the Minnesota Opera’s Resident Artist Program and competing in the Upper Midwest Regional competition of the Metropolitan Opera National Council Auditions. He made his Minnesota Opera debut as the role of Sonora in Puccini's La Fanciulla del West and performed the role of Young Raymond in the world premier of The Manchurian Candidate by Kevin Puts as well as the role of El Dancairo in Bizet's Carmen. He will be returning to Minnesota Opera to perform the role of Harlequin in Richard Strauss' Ariadne auf Naxos as well as Sciarrone in Puccini's Tosca. Nicholas Nelson recently performed Sarastro in Mozart's The Magic Flute in a co-production between the Arkansas Symphony Orchestra and Opera in the Rock. Last season he also appeared as Larkens in La Fanciulla del West with Minnesota Opera. From 2010-13, Nelson was a Resident Artist at Portland Opera. Roles in Portland include the Mandarin in Turandot, Inigo Gomez in Ravel's L'heure Espagnole, Masetto in Mozart's Don Giovanni, Angelotti in Tosca and Pistola in Verdi's Falstaff. He also appeared in Portland as The Pope/ Cardinal Barberini in Philip Glass' Galileo Galilei. This production was the basis for the world premiere recording of the opera. Nelson also performs as a guitarist, thereminist, and actor in spoken theater. John Taylor Ward, who is new to this site, was born into a musical family in Boone, North Carolina that featured bluegrass and Broadway tunes. He is also the associate artistic director of the Lakes Area Music Festival. Ward appeared as a boy soprano soloist at the National Cathedral in Washington, DC, Durham Cathedral in the United Kingdom and Claire and King’s Colleges in Cambridge. He received his Bachelor's Degree from the Eastman School of Music in and went on to pursue his graduate studies at the Yale School of Music, where he is currently a doctoral student. Ward has recorded popular songs written in, around, and about Connecticut in the years 1880-1915. Taylor is a notable interpreter of the roles of Jesus in Bach’s Passions, having performed them across Europe and America with maestro Suzuki, Juilliard 415, and the Yale Schola Cantorum. His Carnegie Hall debut, singing Schütz’s Fili mi Absalon, was listed among Superconductor’s best concerts of 2012, and, in the realm of vocal chamber music, he has made numerous appearances with the eight-voice ensemble Roomful of Teeth, whose debut album recently topped many 2013 album-of-the-year lists, including WNYC’s Soundcheck. As a founding member of the New Haven-based Cantata Profana, Taylor recently performed Sir Peter Maxwell Davies’ 8 Songs for a Mad King. Performances of La bohème will be on August 8 and 9 at the Tornstrom Auditorium in Brainerd, Minnesota and are free to the public. 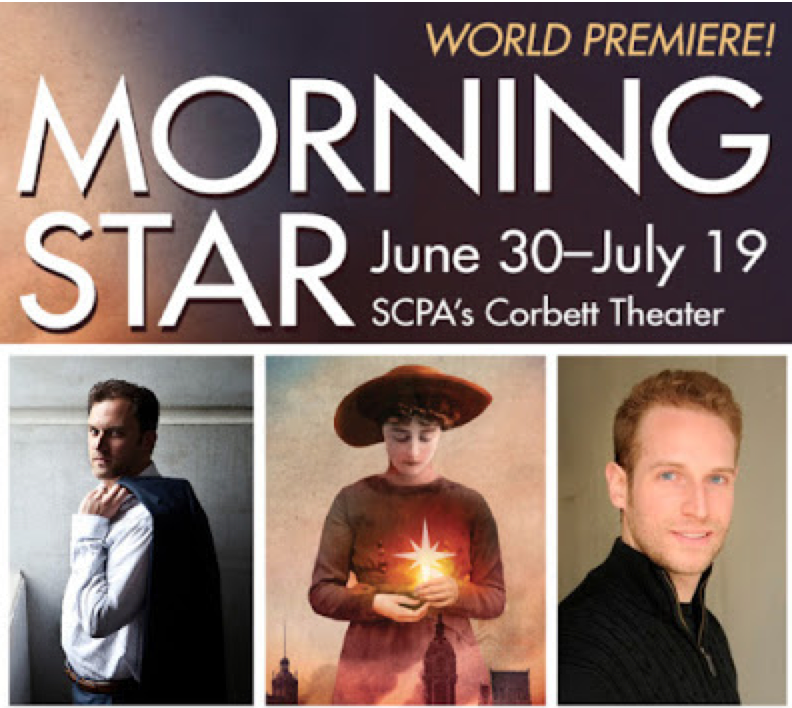 The Cincinnati Opera is presenting its first world premiere in 50 years with Ricky Ian Gordon's Morningstar, which opens on June 30th and runs through July 19th. 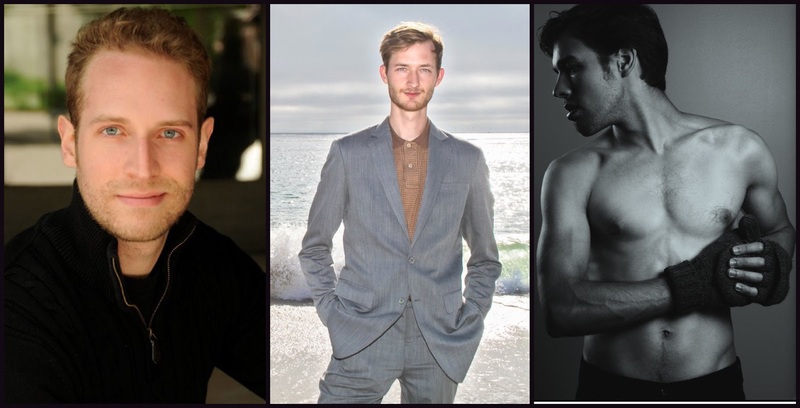 The cast features two barihunks familiar to readers of this site, Morgan Smith as Aaron Greenspan and Andrew Lovato as Harry Engel. The cast also includes Twyla Robinson as Becky, Elizabeth Pojanowski as Sadie, Elizabeth Zharoff as Esther, Jennifer Zetlan as Fanny and hunkentenor Andrew Bidlack as Irving Tashman. The libretto was adapted from Sylvia Regan’s 1940 play about Russian Jewish immigrants living in New York City's Lower East Side in the early 20th century. The story revolves are eh 1911 Triangle Shirtwaist fire where 146 workers perished, most of whom were Jewish and Italian immigrant women. Gordon's grandmother, Rebecca Lieberman, who worked at the sweatshop survived because she was home sick the day of the fire. Gordon teamed up with libbretis William M. Hoffman, who wrote the play As Is and the libretto for The Ghosts of Versailles to compose the piece for the Lyric Opera of Chicago. That effort failed to materialize, but the opera got a second chance in 2012, when Opera Fusion: New Works teamed up with the Cincinnati Opera and the University of Cincinnati's College-Conservatory of Music to present the work at a workshop for unproduced contemporary operas. Israeli barihunk Oded Reich, who is new to Barihunks, will open on July 3rd in the world premiere of Yoni Rechter's Schitz, which is part of a double-bill with Haim Permont's The Lady and the Peddler at the New Israeli Opera. Both operas feature all-Israeli casts. Schitz has a libretto by Hanoch Levin and edited by Muli Meltzer. It tells the story of the Schitz family, a stereotypiccal Israeli family who want to get daughter Shprachtzi married. Desperate to get away from her parents, she meets a former IDF officer Tcharchess, sung by Reich. She wants a wedding ring and a family, but he wants the family inheritance and schemes to get rid of the parents. War breaks out and things don’t quite go as planned for everyone involved. The Lady and the Peddler is set in Russia of 1940 and centers on an exiled Jew trying to make his way through life. Performances run through July 10th. For tickets and more information for the double-bill, call (03) 692-7777 or order online. Oded Reich studied at the Jerusalem Music Academy before becoming a member of the Israeli Opera Studio in 2011 and the Israeli Opera in Tel Aviv. At the Israeli Opera he performed the title role in Mozart's Don Giovanni at the Akko Festival, Prince Yamadori and the Imperial Commissar in Puccini's Madama Butterfly, Marullo and Usciere in Verdi's Rigoletto, Marchese and Dr. Grenvil in Verdi's La Traviata, Montano in Verdi's Otello, Silvano in Verdi's Un Ballo in Maschera, Luther in Offenbach's Les contes d'Hoffmann and other roles. He is also a founding-member of Profeti della Quinta, an ensemble of male voices performing a repertoire of Renaissance and early Baroque music. 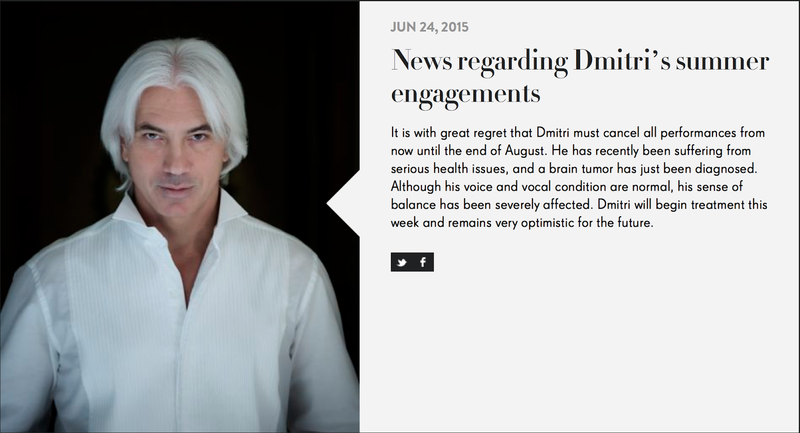 Dmitri HvorostovskyWe've received numerous inquiries regarding Dmitri Hvorostovsky's health, since a message was posted on his Facebook site and website announcing that he has a brain tumor and canceling all appearances through August. We contacted his agent Mark Hildrew at Askonas Holt, but he could not provide up much additional information. However, our sources in London tell us that he's arrived there with his wife Florence and two children. He is allegedly receiving treatment at Royal Marsden Hospital, which specializes in cancer treatment. It is not known how long the treatment will take. On July 3rd, the San Francisco Opera is continuing its annual tradition to simulcast opera to AT&T Park, home of the World Champion San Francisco Giants. 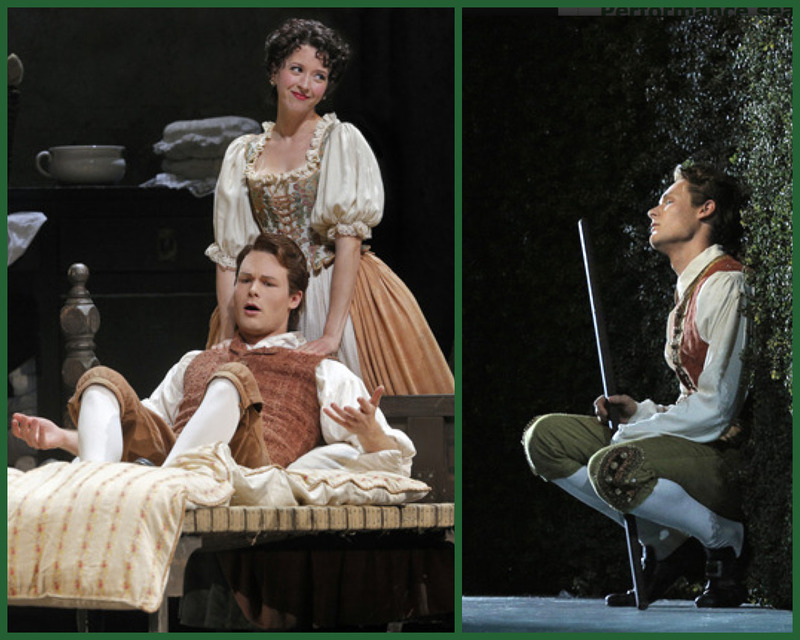 The production is headlines by two barihunks, Philippe Sly as Figaro and Luca Pisaroni as Count Almaviva. Sly makes his role debut in this production and Pisaroni returns to reprise his successful performances from 2010. 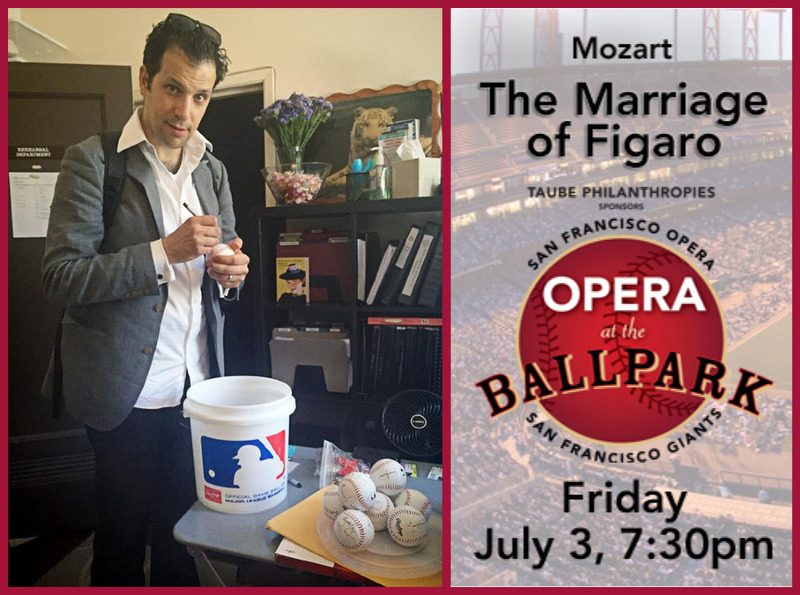 This is the San Francisco Opera’s 13th simulcast and it will be transmitted live from the stage of the War Memorial Opera House to AT&T Park’s high-definition scoreboard. The performance will begin at 7:30 PM and it is recommended that people register for tickets online. Grand Island, New York native James Wright is new to our site, but may be a familiar site to devotees of the Metropolitan Opera National Council Auditions, where he has competed twice in the Buffalo/Toronto District division. He was inspired to pursue singing after hearing Bryn Terfel sing in Wagner's Das Rheingold at the Metropolitan Opera. 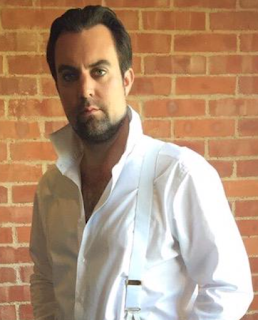 He's currently singing the Count in Nickel City Opera's production of Mozart's Le nozze di Figaro, where someone on the production staff suggested that he be featured on Barihunks. Performances are on June 26 and 28 at the Riviera Theatre in North Tonawanda, New York. Wright is also the Artistic Adminstrator of the company, as well as an adjunct professor of voice at Canisius College. Figaro will be sung by Valerian Ruminski, who founded the company. He has performed Gruffydd in Roger Ames’ How Green was My Valley with El Paso Opera, Angelotti in Puccini's Tosca with Nickel City Opera, The Pilot in Rachel Portman’s The Little Prince with Opera Sacra, John Sorel in Menotti's The Consul with Western New York Chamber Orchestra and Papageno in Mozart's The Magic Flute with Undercroft Opera of Pittsburgh. Upcoming performances include being a festival artist at Sherrill Milnes' Savannah Voice Festival this summer where he will perform Richard White in Michael Ching's Alice Ryley, a Savannah Ghost Story. 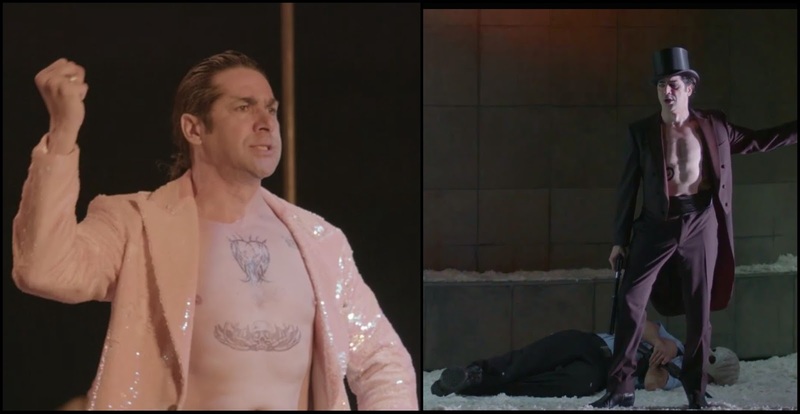 Italian barihunk Ildebrando D'Arcangelo is starring in director Philipp Stölzl’s psychologically gripping production of Gounod's Faust at the Deutsche Oper Berlin. Stölzl, who has also directed Wagner's Rienzi and Parifal with the company, has also made his name in film. He directed “North Face,” “Goethe!” and “The Physician,” as well as music videos for Madonna and Garbage. There are additional performances on June 27 and 30, and July 2 and 5. 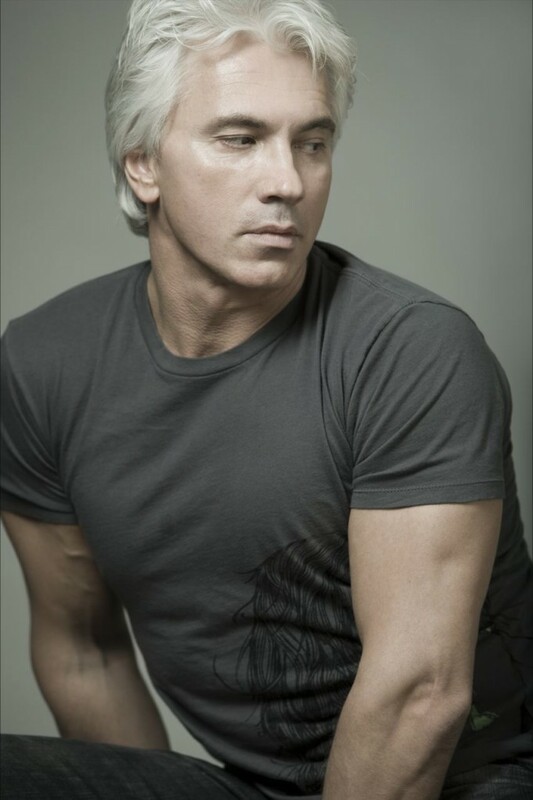 After Faust, D'Arcangelo heads to Verona to perform the title role in Mozart's Don Giovanni. In November, he returns to Berlin to perform the Count in Le nozze di Figaro at the Staatsoper with fellow barihunks Lauri Vasar as Figaro and Olaf Bär as Antonio. 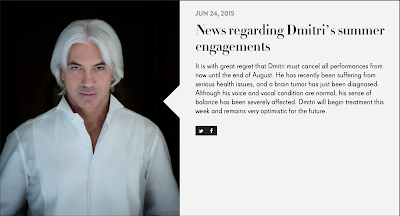 The following message appeared on Dmitri Hvorostovsky's Facebook page and website today. As many of our readers know, he was one of the inspirations for the creation of this site. We wish him a speedy recovery. "It is with great regret that Dmitri must cancel all performances from now until the end of August. He has recently been suffering from serious health issues, and a brain tumor has just been diagnosed. Although his voice and vocal condition are normal, his sense of balance has been severely affected. Dmitri will begin treatment this week and remains very optimistic for the future. " CORRECTION - JUNE 24, 2015: We were informed that we were sent a cast list with the wrong Escamillo, as David Soar is singing the role and not Paulo Szot. We apologize for any inconvenience. David Soar was born in Nottinghamshire and studied at the Royal Academy of Music and the National Opera Studio. Highlights in his 2014/15 season include Pistola in a new production of Falstaff at the Saito Kinen Festival and a return to the Metropolitan Opera as Colline La bohème. ORIGINAL POST: The Glyndebourne Festival will feature a barihunk trio in David McVicar's production of Bizet's Carmen with Paulo Szot as Escamillo, Christophe Gay as Le Dancaire and Gavan Ring as Moralés. The opera will run from June 28-July11 and the cast also includes Stéphanie D'Oustrac as Carmen, Pavel Cernoch as Don Jose and Lucy Crowe as Micaela. Tony Award-winning baritone Paulo Szot remains one of the most popular singers in the world of opera. Later this year, he'll reprise the role of Dr. Falke in Die Fledermaus at the Metropolitan Opera alongside Toby Spence, Susan Graham and Lucy Crowe. Other recent appearances at the Met have included the Captain in John Adams' The Death of Klinghoffer and Kovalyov in Shostakovich's The Nose. We introduced Gavan Ring to readers in October 2014 after having been impressed by his performance in the Wigmore Hall/Kohn Foundation International Song Competition. After Carmen, Ring heads to the Edinburgh International Festival to perform Bill Bobstay in HMS Pinafore and then to Opera North for Figaro in Il barbiere di Siviglia. Next year, he'll be back at Opera North for Guglielmo in Così fan tutte. Christophe Gay, who is new to this site, graduated from the Nancy Conservatoire National in Singing and Chamber Music. He made his debut at the Nancy Opera House in Dallapiccolla's Il Prigioniero followed by Re Cefalo in the world premiere of Detlev Glanert's Enigma at the Montepulciano Festival. 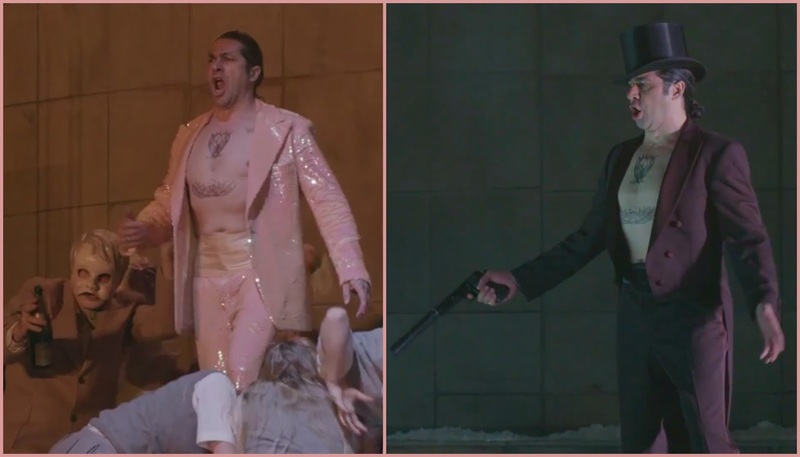 In September, Gay will sing Monsieur de Brétigny in Massenet's Manon at the Opéra de Marseille, followed by Bobinet in Offenbach's La Vie Parisienne.